The snow is coming, it's slow but it's coming. I'm excited that the February issue of Lonny came out today because it gives me something to read as I curl up on the couch and watch the snow blanket the city with a pretty white dusting. Yes, 4-8 inches of snow here is considered a dusting. **Don't forget to enter the giveaway for the Graphic Image notebook!! Contest ends tomorrow night. Oh how chic, I love the playful mix. 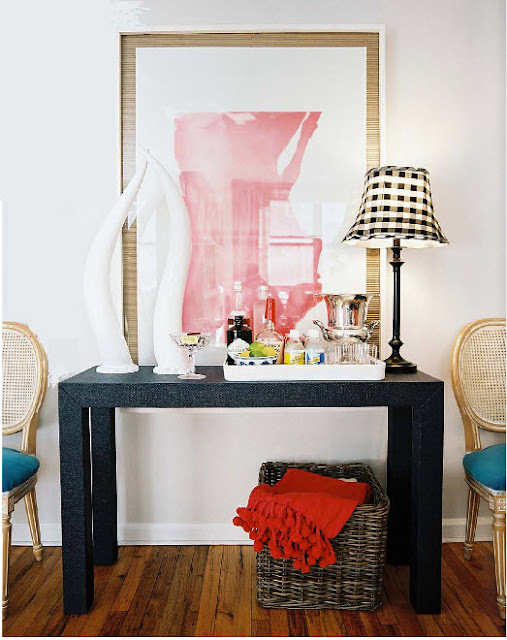 I love the Parsons table in the pic...wonder what it's covered with. Oh sitting here going through it as well. Totally forgot to enter give-away. Off to do it now! I miss MA where 8 inches is a dusting. Here in D.C the snow plows have stopped plowing because of "inclimate weather." I'm curled up w/ Lonny too though! I grew up in Northern IL, where 8" was considered "Not too bad for Spring Break". :-) Now I live in AR... we got 8" on Monday. Schools were preemptively closed Monday and haven't resumed yet. And, since we are due for another couple inches tomorrow, the school kids will probably get the rest of the week off! I, however, am at work. The leftover Northerner in me just can't NOT go to work when it's only snow. When it's ice - yeah, I'll stay home. We have no salt trucks or snow plows here! I wish the snow would fall here in Alabama! Enjoy the calm....DC is buried. They weren't even letting the snow plows out last time I turned on the TV! I've been anticipating the third issue for months now! I just finished flipping through it and I love it (as expected right?) Great post and amazing blog! So glad I found it. Can't wait to look at the new Lonny tonight after everyone goes to bed. Have only seen sneak peeks on blogs but it looks great! Oh so jealous you got to stay home. I had to work all day long! Can't wait to get into Lonny but I think it'll have to wait for the weekend. bummer! love this! I want to create my own piece of artwork after that picture's fashion. Christina, if you do that I totally want to see it! It would be a priceless work of art for sure.